I love me some blues! So to break up the winter vamps, I decided to bring some blue into my long, cold, winter days. Introducing Henley Regatta. The Application: The application was smooth and painless thanks to a great formula. Though I found Henley Regatta to be very sheer in its coverage making it necessary for me to use three coats to make it opaque. Because of this issue, it’s best to use a similar base color before apply Henley Regatta to make it opaque faster. Butter London is expensive so three coats is kind of a waste of polish especially since Butter London is more expensive and has less polish in its bottles than most companies. 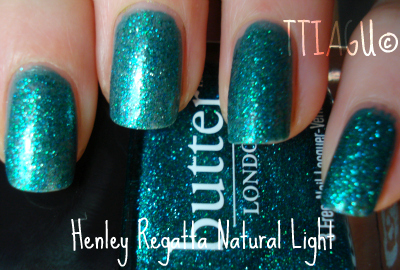 The Color: Henley Regatta is a tealish glitter with a lot of sparkle. I love bluish polish, I love glitter so I was pretty excited to get this one on my digits. Maybe I am a killjoy, but after applying it, I realized it was just there. To me, it was nothing special really. The Verdict: I wanted to love Henley Regatta as it should be a dream polish for me with it’s bluish, glitter, goodness, but in the end, I was not a fan. It took three coats to become opaque and after one day, it began to chip in huge hunks. Not the quality one would expect from a $14.00 polish. Luckily, I got this one for under $7.00 but I’m still disappointed. In the end, I can’t really recommend Henley Regatta due to its poor wear time and lack of opaqueness. Butter London’s New Collection 2012 Spring/Summer Collection will soon be released. Winter’s still in full swing here in NYC, though it’s in the 50’s once again, but I know the cold snap is rightfully around the corner. I dislike the winter, so seeing these bright flashes of color put a smile onto my face. Here’s a sneak peak at the colors. I am pretty excited about this collection! I love the bright colors of Spring and Summer and the fun in brings to NYC. Yes, a lot of people tend to wear black, even during the warmer days, but not this girl. I guess I tend to let my transplant self show with my love forbright and fun colors! Bossy Boots is a light pistachio green and is the neutral of the group. Why not? There is always a need for another classy neutral for the office or “serious” functions. Slapper is gorgeous! It’s a bright teal nail polish which hopefully looks good with my pale, cool skin tone. I think this may be similar to Barielle’s Do Unto Others. Hopefully Butter London’s formula plays better. Disco Biscuit! The name alone scores points with me because it’s outrageous, still better than many of OPI’s names. Disco Biscuit is a hot pink polish with flecks of iridescent glitter. It reminds me of Butter London’s Snog but with a little more oomph! This is not a color for wall flowers. Knackered, this is what I’m talking about! I love blue polish, it never gets old. Ever! Butter London describes it “as a sheer, twinkling oyster shade flecked with micro glitter particles.” What that means in my language is it appears to be a iridescent, purplish blue, polish with micro glitter to amp up the color. I am so excited about this one! I will be getting these colors in less than two weeks and hope to get the swatches up by January 22, 2012 if everything works out well. I will be graduating that weekend, so who knows. Either way, the swatches will be up in about two weeks and I can’t wait to test them out. Tis the season for me to wear glitters so I can light up like a Christmas tree! That’s right, I love the loud glitters during the holiday. Okay, I love them during every holiday or non holiday though I dread the removal. Still, sacrifices must be made to keep the festive mood alive! 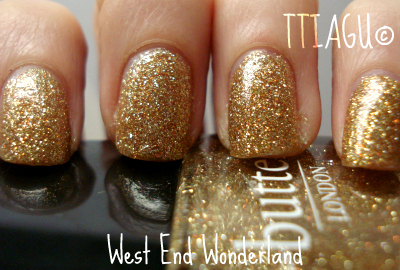 So onto Butter London’s West End Wonderland. 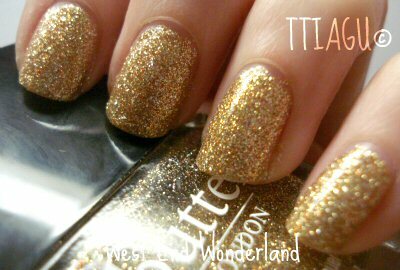 The Application: Though West End Wonderland is thicker than a normal nail polish thanks to the glitter, it went on smoothly. Also, I really like Butter London’s brush and the packaging is just plain awesome! The brush is smaller, but it’s good quality and made putting on West End Wonderland a snap. It did take three coats for West End Wonderland to be completely opaque. 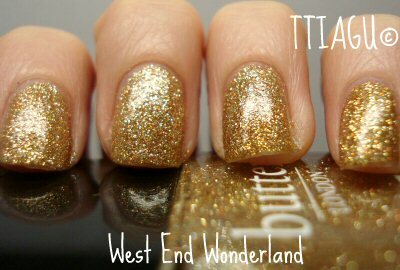 The Color: West End Wonderland is a light gold glitter polish which is perfect for the holidays. What I like about West End Wonderland is that it isn’t some dark, gaudy, gold color that screams tacky mess. The light two toned gold makes this polish pretty tame for a gold glitter and the addition of red glitter almost makes it look like Christmas lights making this one cool polish. Unfortunately, West End Wonderland did chip after two days which was a disappointment, especially for the price tag. 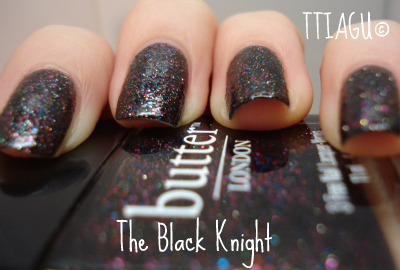 The Application: The formula for the The Black Knight was a little thicker than most Butter London polishes and was a little streaky and uneven. But this lasted only through the first coat. The Black Knight is chock full of glitter, but it spreads easily. It did take three coats for The Black Knight to be fully opaque. Also, I have to say, I really do love brush. It’s the baby bear of OPI and Essie’s brush, it’s just right and makes applying polish easy. The Color: The Black Knight is a black jelly based polish. On the first coat it appears gray, but soon becomes black after two coats. 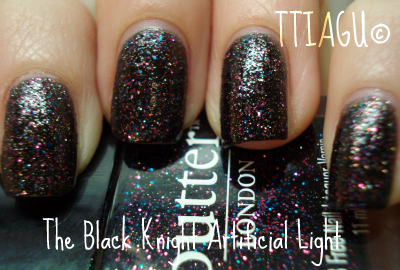 The Black Knight has various sized glitter including square shaped sparkles. Looking at the bottle, it looks as if it only has larger blue and purple glitter. But though those two colors are prominent, there is a whole rainbow in The Black Knight. After applying The Black Knight, I found my reaction to just be “Eh, that’s it?” After building this polish up for myself, the color wasn’t all that amazing. I was a little crushed. The Verdict: I will most likely be unpopular for this, but I’ll go there. I didn’t care much for The Black Knight. In the promo shots, it looked amazing and I think I built it up too much in my head. 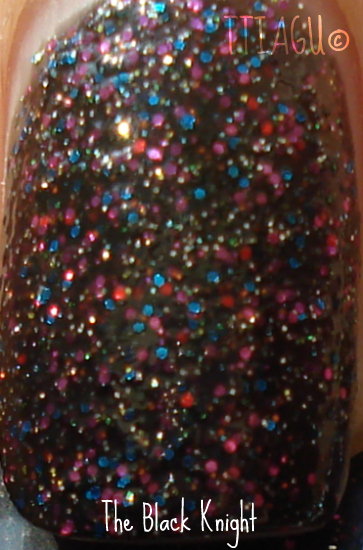 The glitter is rough on the nail even after three layers of top coat. It’s like sandpaper! 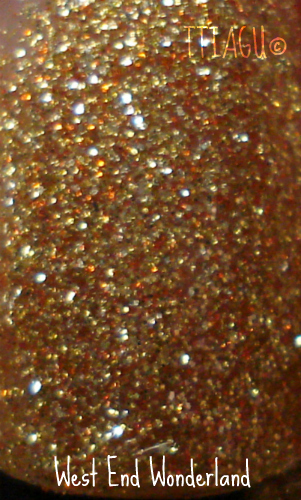 If you look at the close up photo, you will see that the glitter makes the polish bumpy. I guess for me, in the end, The Black Knight was not very special. 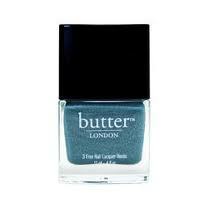 In fact, it just looked cheap and for the price of Butter London, I’m disappointed. I wore it a full day to see if it would grow on me, especially in different lighting, but even in sunlight, it looked cheap. In fact, it ended up chipping in two places in less than 24 hours. I couldn’t wait to get it off! But different strokes for different folks. I know many will still love this color even with its downfalls. For me, it was one disappointment and will most likely go to a nice loving home. Now onto the good news. Tart With a Heart! 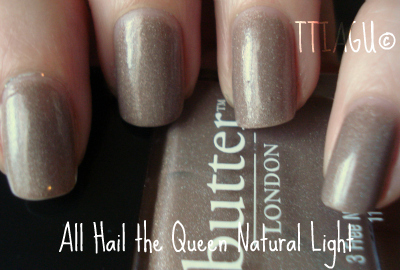 All is not lost for the Butter London 2011 Holiday Collection. Oddly enough, the color I thought would be nothing special turned out to be one of my favorite polishes of the season so far! The Application: So much better than The Black Knight! It went on smoothly, though if you take your time, it does start to seize a little so move fast. It’s pretty easy to do because it’s such a light color. Tart With a Heart is very sheer so three coats should do you though it still won’t be fully opaque. For me it didn’t matter because there is so much sparkle I didn’t even really notice until I looked closely. 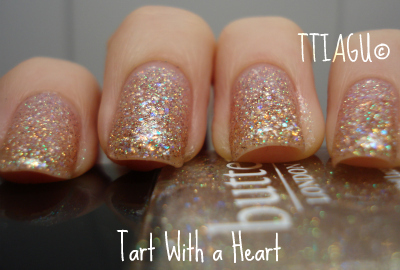 The Color: The base of Tart With a Heart is a light tannish, pink color with various sizes of iridescent glitter that change color depending on the light source. You can’t tell looking at the polish but if you look at the close up photo, you’ll see there is also minuscule black glitter thrown in to make things real interesting. The Verdict: Tart With a Heart almost makes up for the major disappointment that is The Black Knight. Though it has a terrible name, I love this polish so much! It has so much depth and is girlie without being obnoxious. And though it’s almost pure glitter, it’s not outrageous. Again, I am so in love with this color, I will be buying a back up for sure and so should you! I tool a lot of photos of Tart With a Heart because I love it so much. I almost feel like a proud new parent! Enjoy! Tomorrow I start a new job and so I have to start off on the right foot. That means a neutral nail polish and then slowly make my way up to the vamps and then the polishes that are a little more extreme. It’s a slow but promising progression. So to start my first day right, I present Butter London’s All Hail the Queen. 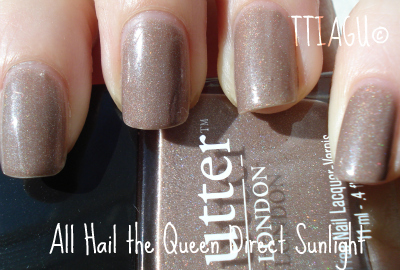 The Application: Normally, Butter London’s nail polishes apply just like butter, but All Hail the Queen was a little thick and goopier than I am used to for this brand. Maybe it’s the formula or maybe I just received a bum batch or an old bottle, but it ended up being sort of a nightmare. I will use a little thinner on All Hail the Queen next time. The brush is small but very easy to work with. It also took about three coats to become opaque. 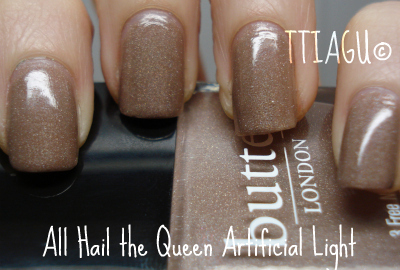 The Color: All Hail the Queen is a taupe color with a dash of lavender. 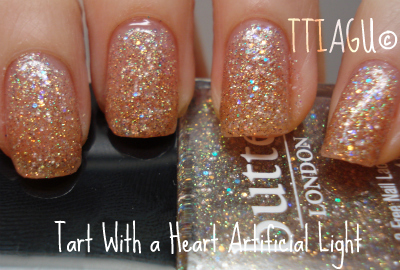 And if that isn’t intriguing enough for you, Butter London threw in a little bit of holographic sparkles. Okay, when you think of a work safe neutral nail polish, holographic shimmer doesn’t normally come to mind, but I promise you this polish is completely work appropriate as it’s a scattered holographic shimmer and very professional looking. I love the linear holos as well, but you can’t shock you employer too early on. The Verdict: There has been a lot of buzz about All Hail the Queen for quite sometime so I was pretty stoked to finally pick up a bottle on the buy 1 get one free sale a while ago. I can see why so many people would love the color. It’s the perfect work safe neutral and would work in just about any environment. Also, the touch of holographic shimmer takes it to the next level without being obnoxious. But for me personally, I ended up finding All Hail the Queen to be just “eh”. That doesn’t mean I hate it, not at all, I’m just not blown away, but I would definitely wear it again. I guess in the end, it just didn’t live up to the hype. All Hail the Queen and All Its Sparkles! 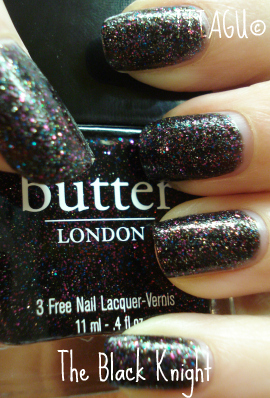 After great success with Wallis, I was ready to try Butter London’s Victoriana from the 2010 Fall collection. I love blue, I really do. I know some consider blue to be strange or just overdone. For me, I just think it’s glorious! I never grow tired of it so you can imagine my happiness when Victoriana fell into my grasp thanks to a fantastic sale. 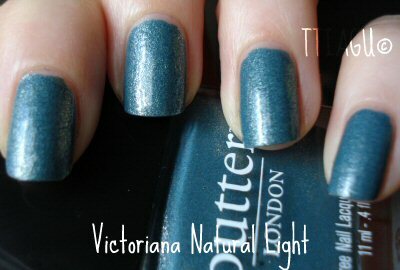 The Application: So far Butter London has treated me well with their formulas and Victoriana was no exception. The application was a snap due to the great consistency and after the first coat, Victoriana was almost completely opaque. Impressive! Still, for the best results, it’s best to put on two coats to make sure Victoriana lives up to its full potential. The Color: Victoriana is a smokey, bluish, gray color with micro flecks of whitish silver. After seeing it in the bottle, I was pretty stoked to try it on as I love me some blues! Yes, I love blue so much it messes with my grammar! After trying on Victoriana and wearing it for a full day, I realized, it was just okay. For me it really wasn’t anything special for a blue and didn’t really leave a lasting impression, it was just there. The Verdict: I guess I just wasn’t all that impressed with Victoriana. The formula was perfect, the packaging is ridiculously awesome, the color looks perfect in the bottle, but to be honest with you, it did nothing for me while wearing it. I don’t know, I guess I just didn’t connect with it as I feel there are more intriguing blues out there. In fact, after two days I threw on China Glaze’s Atlantis to spice it up. When in doubt, always throw on glitter or foil flakes. Though, Victoriana was a no for me, I am sure there are plenty of lovely ladies out there who will absolutely love Victoriana. I don’t want to be in love with Butter London, but here I am. Due to a few great sales, I keep finding myself buying more. The colors so far are unique, long wearing and have a great formula. The Butter London Holiday 2011 Collection is now available and it appears to be only three colors. Fine by me, less temptation. Fairy Lights happens to be a reissue while the other two polishes are new and absolutely enticing if you’re a glitter girl. Even if you’re not, you will have a hard time passing these two by! 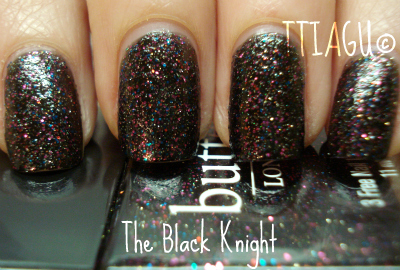 PS: I’ll be swatching The Black Knight and Tart With a Heart Next week! Fairy Lights is described as a liquid metal rose pink. To me it looks to be more of a metallic purple pink, but that could just be the promo shot. I’m not a huge fan of metallics so I may have to pass on this one. 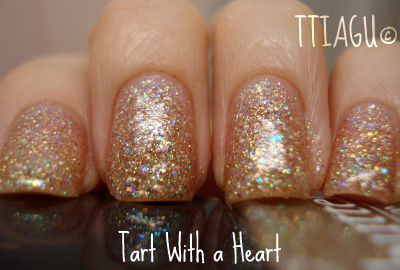 Tart With a Heart is a pale pink polish with what appears to be glitter of various pastel colors. Lots and lots of glitter! It’s very pretty and dare I say it feminine. I tend to like bolder colors, but every once in a while you need a little femininity in your life. Bring on Tart With a Heart! I wouldn’t consider this a Holiday color as it seems to be more of a Spring or Easter color. But you know what? It’s gorgeous so who cares, right? Last up, The Black Knight. Yes, I want this one. I really, really do. It appears to be a blackish, purple with pink and blue glitter. This is the perfect winter shade right here. Part vampy, part parade of glitter, complete winner! Though all three of the colors are quite pretty, I feel as if I have seen Fairy Lights before. It’s possible that I need to see it in person though before making that assumption. Hopefully, I will be able to get the swatches up soon as it turns out I most likely will be scoring these soon. Yes, Black Knight shall be mine!